Clermont Auvergne are out of Europe after Bordeaux-Begles won 38-27 at Stade Marcel-Michelin. Heading into the final play of the game, all Clermont needed was a losing bonus point to guarantee a spot in the final eight of the Champions Cup but Morgan Parra turned down a likely three points to tap a penalty which came to nought. The decision proved costly and one of the pre-tournament favourites are now out of the competition. Clermont had led 28-20 after 62 minutes but conceded 17 points while down to 14 men with Julien Bardy in the sin-bin to suffer a 37-28 loss to Bordeaux-Begles. It ended Clermont's 25-game winning run at home in Europe going back to 2008 as they finished bottom of the group in which Exeter booked a place in the knock-out stages thanks to a bonus-point win over Ospreys. Clermont, who began the day two points behind Ospreys, made a dream start by racing into a 14-0 lead after six minutes thanks to tries from Jonathan Davies and Noa Nakaitaci, both converted by Morgan Parra. However, forwards Berend Botha and Sebastien Taofifenua both powered over for tries, goaled by Lionel Beauxis, as Bordeaux drew level and two penalties from Baptiste Serin either side of half-time put them 20-14 in front. 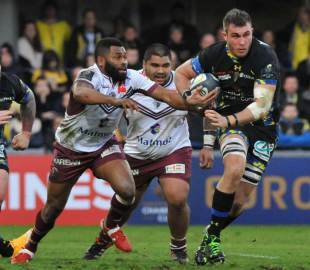 When Damien Chouly and Paul Jedrasiak went over for quickfire tries, Clermont looked to have booked their last-eight berth but Bordeaux made full use of the extra man, with Paulin Riva and Peter Saili scoring tries that broke the hearts of the home fans.